I shall never forget that first night.… Soon after I was settled in bed the rats began to stir, one running over my pillow. I was wondering whether to go to sleep and not mind the rats or to get up, when I felt a few bites and then it dawned on me that there were bedbugs at hand .… The night attendant didn’t know what to do so I sat up with him until … two or three o’clock in the morning .… [Then] I finally got a little sleep. Layman was one of about 12,000 men who performed alternative service as conscientious objectors (COs) during the war through the Civilian Public Service. Men from dozens of religious groups were COs, but the Mennonite contingent with 4,665 COs represented by far the largest church cluster, with the Church of the Brethren being the second-largest group with 1,353 COs, and the Society of Friends (Quakers) the third-largest with 951 COs. Approximately 3,000 of these COs were assigned to some 40 mental health institutions across the country, filling a desperate need for staff after conscription for soldiers and budget cuts necessitated by the war. As reflected in their diaries, letters and later recollections, many of these young men were appalled at the inhumane conditions they encountered. 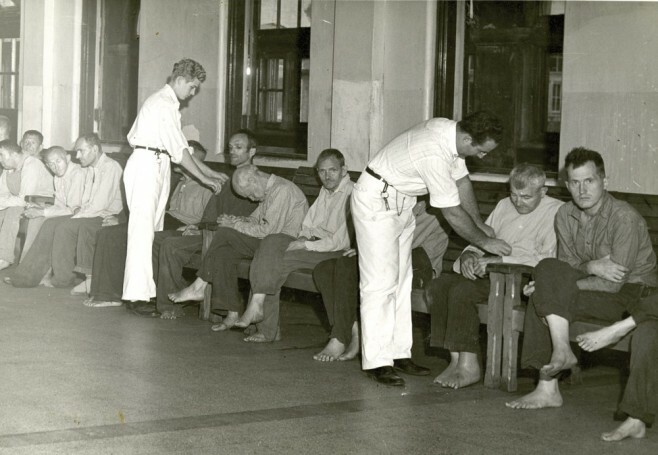 As I encountered the deplorable conditions on the mental health wards – unsanitary filth, patients tied to chairs, in straight jackets, locked in dingy rooms, and sometimes beaten by previous attendants – I became aware that this was an issue of justice. At another facility staffed by MCC personnel, the Hudson River State Hospital in Poughkeepsie, New York, Willard Linscheid reported that he was assigned to a ward of 110 to 120 patients, with just one male nurse and one other attendant on duty. Because of the large number of incontinent and destructive patients, clothing was destroyed and soiled – much of the time the disturbed patients in the small day room were entirely naked. Because of the wartime shortages of sheets and blankets the majority of patients had only one sheet or blanket on their beds most of the time. If possible, the disturbed and incontinent patients were also given a blanket or sheet, but much of the time they slept naked and uncovered on the hard canvas mattresses. Charlie Lord, a Quaker CO at a Philadelphia mental hospital known as Byberry, secretly took a series of pictures that ran in Life Magazine on May 6, 1946, as part of an exposé of the horrific state of the country’s mental hospitals. Lord’s photos showed groups of naked men, huddled together on the bare concrete floors of otherwise empty, cell-like rooms, frighteningly evocative of scenes from European concentration camps still fresh in the minds of the American public. How did thousands of conscientious objectors end up working in mental health institutions in World War II? The answer starts centuries earlier. For generations, members of the traditional “peace churches” – the Anabaptists, including the Mennonites, Amish and members of the Church of the Brethren, along with the Quakers – have taken the position that Jesus opposed killing other humans or even treating them violently. Period. For many, this position extends to not supporting organizational efforts to kill people, as represented by military efforts. Before the twentieth century, religiously inspired non-combatants in North America and Europe typically were expected to provide substitutes for their lack of military service, pay stiff fines, or do prison time if they resisted conscription. The consequences for refusing to fight were sometimes severe. In the region of Virginia where EMU is now located, Mennonites were hunted down for their refusal to join the Confederate Army in the 1860s. During the last year of the war, when the Confederacy was sorely in need of men. . . attempts were made to impress young Mennonites into the army, with the result that many went into hiding in the mountains [of western Virginia], some of them being hunted by army scouts who had orders to shoot them at sight. During World War I, men who refused military service on religious grounds began to be called “conscientious objectors” or “COs.” In addition to men in the peace churches, there have been COs in smaller numbers from dozens of faith traditions, including Catholic, Methodist, Baptist, Presbyterian, Lutheran, and Jewish. Jehovah’s Witnesses also consistently refuse to do military service, though their reasons typically are different from those of most COs. In the WWI era, 138 Mennonites were court-martialed for refusing to comply with conscription and were sent to prison. Nearly 2,000 other Mennonite men, however, were able to do alternative service in camp-type settings, a role for COs negotiated by the American Friends Service Committee (a Quaker organization). Yet most COs were not given productive roles in the WWI-era camps. More often they were subject to degradation. Men were forced to stand at attention, sometimes with outstretched arms for hours and days at a time on the sunny or cold side of their barracks, exposed to the inclemencies of the weather as well as to the jeers and taunts of their fellows until they could stand no longer; chased across the fields at top speed until they fell down exhausted, followed by their guards on their motorcycles; occasionally tortured by mock trials, in which the victim was left under the impression to the very last that unless he submitted to the regulations the penalty would be death. Every conceivable device – ridicule, torture, offer of promotion and other tempting inducements were resorted to in order to get them to give up their convictions; but with only few exceptions the religious objectors refused to compromise with their consciences. The counter-productive treatment of CO’s during WWI motivated leaders of the peace churches to lay the groundwork for better alternative-service possibilities during future wars. The Selective Service Act of 1940 provided for COs to do work of “national importance” under civilian direction. In World War II, this work took the form of largely unpaid labor – on farms and on government-owned land, fighting fires, being guinea pigs in medical experiments, and working in understaffed hospitals, particularly mental institutions. Despite the conditions under which they labored – and their extraordinary length of service (the last COs were released in March 1947) – COs were treated scornfully in wider society. They were called cowards and worse epithets, hung in effigy, refused service in public places, and subject to venomous campaigns by veteran’s groups. To ensure hardship, the COs were required to serve at least 100 miles away from their homes. Most of the Mennonites did their alternative service under MCC’s umbrella – an arrangement set up with the federal government. MCC assigned them to federally approved work situations and provided the only compensation they received, which was no more than $15 monthly for essentials (shoe polish, shaving cream, toothpaste, and such). Though it never attained the infamy of Pennsylvania’s Byberry, Virginia’s Western State Hospital in Staunton, Virginia, less than 30 miles south of EMU, had similarly disturbing conditions. It was one of the first institutions staffed by COs. Charged with assisting 2,000 patients, the first 19 men sent by MCC worked an average of 76 hours per week for their first year in this hospital, receiving an allowance of $2.50 per month. One CO did not have a single free day in seven months of work. Eventually a total of 110 COs worked in this institution between 1942 and 1946. Among the EMU alumni in the CPS unit at Western State Hospital was Clarence Kreider ’40, who kept a journal detailing the inadequate meals served to hard-laboring staffers (e.g. on January 3, 1943, beans and prunes for lunch, and red meat and sour pears for dinner; the next day, potatoes and apples for lunch, and meat and more apples for dinner). When a Staunton Episcopal priest, W. Carroll Brooke, learned about the appalling conditions for both patients and employees at Western State, he gathered testimony from the COs in Civilian Public Service (CPS). Together they urged officials at the state level to replace the hospital’s superintendent and increase funding for mental hospitals. Trained cooks were among the improvements to emerge from the efforts of Brooke and the leaders of CO units in other Virginia hospitals. In 1945 Harry L. Kraus Sr. asked to be assigned as a CO to Western State, in part to be closer to his future wife, Mildred Brunk, living in Harrisonburg. Caring for the patients at Western motivated Kraus to overcome great odds to become a physician after the war. He and Mildred raised chickens to pay the fees for his undergraduate studies (he started at EMC but finished at Bridgewater in 1951, for reasons of class scheduling). With as many as 300 patients for each attendant, however, there were times that the COs felt uncontrollably frustrated, showing “fits of temper” and employing “unnecessarily rough language and rough handling of patients,” admitted Linscheid. Yet the patients and their families expressed gratitude to the CPS-assigned workers, telling the COs they were doing a much better job than previous staffers. Our efforts were concentrated on giving better and kinder treatment to the patients and to keep the ward as clean as possible under the circumstances…. We all chafed under this necessity of giving only custodial care and we were all keenly aware of the improvements that could be made with more attendant help, more supplies and better facilities. We were all fired with a desire to expose mental hospital conditions to the general public in the hope that such an exposé would lead to action toward improvement of such institutions. Certainly to work for any length of time on such a ward a person must either agitate for betterment or sear his conscience entirely to the ills of humanity. The COs struggled with how to handle patients’ violent outbursts, especially given the shortage of staff. Henry E. Nachtigal, a 26-year-old General Conference Mennonite from Kansas, died on September 1, 1945, after he received a head injury from a patient at Western State Hospital in Staunton. Patients in a New Jersey hospital killed an abusive attendant – who was not a CO – with his own billy club. The next night, a Mennonite CO named James Kuhns was told to enter that same ward and take charge. Kuhns went armed only with the keys to open the door to the outside. “I could walk out anytime. They could have taken my keys and walked out too.” But the patients didn’t; they liked Kuhns better than the attendant they had killed. Kuhns worked on that ward for several months and developed relationships that made it “an enjoyable experience.” He especially liked tending long-time residents who had chronic illnesses, such as tuberculosis. By the end of the war, more than 1,500 CPS men had worked in Mennonite-run units at mental hospitals in 14 states, including at least 29 who are EMU alumni. In support of the conscientious objector cause, around 300 women volunteered to work with CPS units at mental hospitals during the war. Edna Ramseyer, a dynamic woman who taught home economics at two Mennonite colleges, Bluffton and Goshen, initiated the “C.O. Girls” with these goals: relieving human need, strengthening the witness of the Christian peace movement, and supporting the stand taken by male COs. Frequently I was assigned to care for the most disturbed patients. I was often frightened but tried not to display my emotions for the sake of the employees and patients. I tried to win their respect by showing love. Some of these volunteers were the wives of COs, but many were college students who used their summer breaks to work in mental hospitals. At the Cleveland State Hospital in Ohio, CPS men and women under the American Friends Service Committee jointly filed reports on how abuse and neglect had led to the deaths of patients. The hospital administration retaliated. Deteriorating work conditions caused CPS workers to be withdrawn from that hospital in November 1943. A year and a half later, at the request of a new superintendent, CPS workers returned under the care of MCC. In 1945, 19 women recruited from Mennonite colleges came and gave “unusually good care” to patients in the women’s infirmary at Cleveland; the following summer, the program was repeated with 22 college women. Be at anytime ready to give witness to what you believe. We met here with some of the group of Mennonites, who are conscientious objectors, and who have volunteered to serve in hospitals for mental cases. They are a very fine group of young men and bring a spiritual quality to their work because of their religion. In many ways, this is probably raising the standard of care given the patients. The superintendent told me that they had undoubtedly raised the standards for the care of patients, and that they had been of tremendous help in disclosing certain practices which existed there and about which he never before could get any real evidence. He said if they could stay longer they would probably improve the standards even more. In late December 1945 I was discharged. I was going home. The overnight trip gave me time to reflect on my four years. I had served in five units from coast to coast. I had switched cultures and church affiliation. I had met wonderful persons in CPS, believers from Mennonite General Conference, Mennonite Brethren, Brethren in Christ and a large number from the Mennonite Church of which I am now a part. I had matured in my Christian faith and was stronger and more sure about my peace position. My experience in three mental hospitals in a small way was a part of the fabric that laid the foundation for our own Mennonite Mental Health program . . .
. . . I arrived in Goshen via New York Central on a Saturday morning and as I stepped off the train there was no band to play, no parade to ride in, not even yellow ribbons tied around the old maple tree. But there was the horse and buggy – my folks were there to meet me and welcome me home. By 1947, as a national reform movement was taking off in response to the Life exposé and other stories told by the COs, MCC had convened a committee to study the possibility of establishing church-sponsored institutions offering mental healthcare services as a humane alternative to the state institutions. In 1949, Brook Lane Farm in Leitersburg, Maryland, was the first Mennonite mental healthcare facility to open its doors, with beds for short-term treatment of 23 patients with acute mental illnesses. While some in the church thought that Brook Lane and other similar institutions should largely rely on compassionate treatment in a “home-like atmosphere,” other leaders in the reform movement cautioned that professional medical staff was a necessity. Eventually, the latter group prevailed. When Brook Lane opened, a psychiatrist from Baltimore began making twice-weekly visits to see patients there. Within a decade, four other church-run facilities to treat mental illness opened across the country. Kings View opened in 1951 in Reedley, California, followed by Philhaven, established in 1952 in Mount Gretna, Pennsylvania. In 1954, Prairie View opened in Newton, Kansas, while the Penn Foundation began seeing its first patients in Souderton, Pennsylvania, in 1956 (it has since relocated to nearby Sellersville). During the 1960s, three more Mennonite-affiliated institutions joined the group: Oaklawn in Elkhart, Indiana (1963); Kern View in Bakersfield, California (opened in 1966, but now closed) and Eden, in Winkler, Manitoba (1967). Grant M. Stoltzfus ’38 was an EMU alumnus who played a role in the post-war establishment of these Mennonite institutions. During his three years of service with the CPS, Stoltzfus had worked for a time at the notorious Byberry hospital in Philadelphia. In 1945, Stoltzfus became the director of a unit at the Woodbine Colony for the Feeble Minded in Woodbine, New Jersey, where more than 20 men worked with hundreds of children with intellectual disabilities. His final CPS assignment was writing educational pamphlets and researching how churches could run mental healthcare facilities for the National Mental Health Foundation, a reform-focused organization sparked by the CPS experience. Stoltzfus eventually served as a professor of sociology at EMU from 1957 until his death in 1974. Former students recall his unflagging interest in mental health care and the way he influenced them to work in the field. Another alumnus who played a prominent role in the early days of Mennonite-led reform in mental healthcare was Norman Loux ’42, M.D. He left a prestigious job at a psychiatric hospital in Rhode Island to serve as the founding medical director of the Penn Foundation. Loux remained in that position from 1955 to 1980. Belying their small size, the Mennonite-sponsored mental health facilities played important roles in sparking wider initiatives. Originally founded to provide the mentally ill with humane and compassionate alternatives to state institutions, their institutional missions soon grew to encompass outpatient and day treatment programs. Another innovative approach taken by many of these organizations was a therapeutic focus on treatment within the larger community, resulting in broader outreach efforts and increased involvement of patients’ families. Volunteers as a significant segment of hospital staffs gradually gave way to increased emphasis on clinically trained staff. This created some consternation among a segment of the Mennonite constituency who had envisioned a “homelike atmosphere” and lay involvement as crucial ingredients of a Mennonite-sponsored mental health program. Increasingly, the encouragement from the center was for Mennonites interested in mental health care to get professional training. Volunteers continue to play a vital role in assisting those with emotional stress to become integrated into the community. The efforts at Mennonite institutions attracted national attention. Prairie View received a gold medal from the American Psychiatric Association (APA) in 1968 for its community mental health services, while Kings View received the same honor in 1971 for its contract model with local government to provide mental healthcare. In the 1960s, Prairie View and Oaklawn were cited as examples of innovative providers of mental healthcare in publications by both the APA and the federal department of Health, Education and Welfare. And in 1964, a profile of the Penn Foundation’s treatment programs was the lead chapter in a book of case studies compiled by the APA. While the church-founded mental health institutions were becoming established and recognized, EMU was taking steps to prepare students for entering the mental healthcare field. Beginning with graduate courses in psychology at Boston University and the University of Virginia, Peachey worked his way toward a doctorate in counseling psychology from George Washington University in 1963. In the late 1960s, he chaired a Rockingham mental health group that preceded today’s community services board. Peachey was president of Hesston College, a Mennonite institution in Kansas, for 12 years before re-settling near EMU, where he earned a master of religion degree at age 70. After establishing its psychology major in 1961, EMU gained accreditation for its social work program in 1975. In 1993, the masters in counseling program became EMU’s first graduate studies program outside of its seminary. As of early 2012, 575 graduates had majored in psychology, 665 had majored in social work, and 221 had earned master’s degrees in counseling. Of course, not all of these 1,461 graduates remained in the mental health arena. This number, though – constituting about 10 percent of our current alumni group – does indicate significant interest in mental health among our alumni. In the spring of 2011, EMU hosted an unprecedented conference called “Conversations on Attachment: Integrating the Science of Love and Spirituality.” A number of internationally recognized speakers cited the results of several decades of research to support their assertions that caring relationships are as necessary to human life as air, food and water. The integration of science and love is reflected in the life of CO James Kuhns. After his CPS years, he earned degrees in the sciences – chemistry, physics and math – at Goshen College, one of EMU’s peer institutions under the umbrella of Mennonite Church USA. For seven years, Kuhns worked in the scientific arena and earned a master’s degree in physical science. He and his wife did MCC service in Ethiopia for three years. But he found himself longing to return to his CPS days when he was focused on people’s minds. He returned to graduate school and earned a second master’s and then a doctorate in clinical psychology. It’s to establish a relationship with other people that is positive to help them become what they can become. . . Not in terms of what you can give to me, but [in terms of] what you are in need of. I will nurture, I will encourage, I will support. And if we show that type of love to our associates – whether it’s parents, child, husband, wife, country-to-country, vocation – problems disappear. This Christian-based emphasis on relationships, on caring, on compassion – on agape – is what caused the Mennonites serving in mental health institutions in WWII to be praised by Eleanor Roosevelt and many of the institutions’ superintendents toward the end of the war period. Many of them are preparing to travel for their churches after the war and undertake relief work in different parts of the world, and what training they get in hospitals here will be of value in the future. By modeling another way – and calling attention to abusive treatment – the EMU alumni who served in mental health facilities joined other COs in transforming the way mental health is handled in North America. And they paved the way for hundreds of future EMU students to embrace the importance of mental health, to view it as a responsibility of a caring community, and to make it their own life’s work. For a bibliography, see the bottom of following page. EMU historical librarian Lois Bowman ’60, assistant historical librarian Cathy Baugh, and alumni database specialist Braydon Hoover ’11 offered considerable research assistance for this report on conscientious objectors. One Response to "Striving for Love Amid Filth and Abuse"
I used to be very happy to search out this internet-site.I wanted to thanks in your time for this excellent learn!! I positively having fun with every little bit of it and I’ve you bookmarked to check out new stuff you blog post.